Briar Hearts are carried by Forsworn Briarhearts. While their exact nature is unknown, due to its natural loot location from Forsworn Briarhearts, it seems they really do serve as actual hearts; from the look of events at Lost Valley Redoubt, dead Forsworn are resurrected in a ceremony by hagravens, replacing their human hearts with these items. Interestingly enough, pickpocketing the briar heart from a Forsworn Briarheart will instantly kill the target. 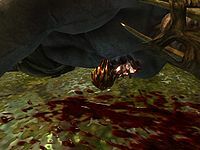 Briarheart NecropsyDB: Examine a Briarheart for Neloth. Events during the Repairing the Phial quest can make all Briar Hearts quest items permanently, meaning you can't drop them or use them in any way. See the quest page for tips on how to avoid this, or fix it if it has already occurred. This page was last modified on 4 September 2018, at 01:07.